THE YEAR 2015 has been a turbulent one for Dunnes Stores when it comes to its workplace relations. The strikes and marches from early 2015, in an effort to eliminate effectively zero-hour contracts for staff among other things, threw the spotlight on the notoriously media-reclusive retailer. But that was a storm in a teacup compared to the farrago Dunnes found itself embroiled in during 1984. And the resultant political and social frenzy left the government in a very uncomfortable position as evidenced by papers released under the 30-year rule by the National Archives. 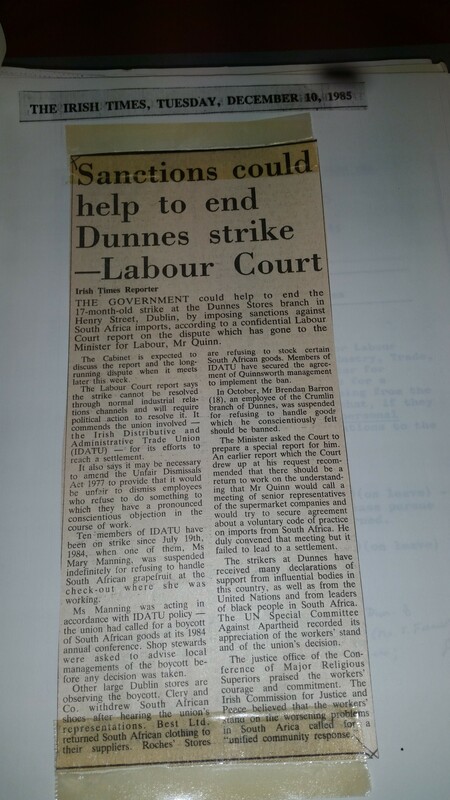 On 19 July 1984, Dunnes Stores till-worker Mary Manning, who was just 21 years old, refused to take for South African vegetable produce at her register in the company’s Henry Street store in Dublin. When reprimanded for doing so, she stood her ground and went on strike, in line with her union’s (the Irish Distributive and Administrative Trade Union [IDATU]) official protocol for dealing with South African goods, enacted due to the South African system of racial oppression. Soon she was joined on the picket line by 12 of her co-workers. The ensuing strike would last almost three years and garner countless headlines, both at home and abroad. Nelson Mandela himself would say that the Dunnes strikers gave him comfort in the final years of his 27-year imprisonment, while the 12 workers would end up journeying to South Africa itself in July 1985 at the invitation of Archbishop Desmond Tutu as a sort of peace-envoy for the end of apartheid. At the time all of the Irish supermarkets routinely dealt in fruit and vegetables from the embattled African nation, mainly because there was nowhere else to get such produce due to seasonality. The South African apartheid regime had long been a troublesome spot when it came to international diplomacy. 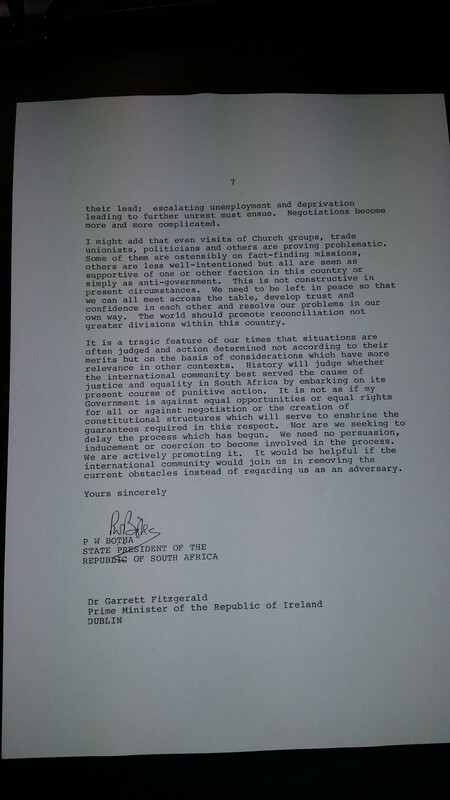 Ireland for its part had no diplomatic relations with South Africa, but did recognise it as a nation. The official line was that trade was discouraged with South Africa, although no concrete sanctions were actually in place. The actions of the Dunnes workers soon spiralled into an international incident, with no less pressure being applied to the Fine Gael/Labour coalition as a result. Apartheid (literally ‘apartness’) was and is a process of racial segregation. Its South African form had been in existence since 1948, enforced via legislation by the ruling white National Party (NP) that remained in power until 1994. Put simply, apartheid saw the rights of the majority black community in South Africa curtailed while rule by the minority white Afrikaaners was maintained. In the early ’80s, racial tension was at an all-time high in the country, while after a booming 1970s the economy had slowed to a trickle. Gradually the NP government was beginning to realise that reform of apartheid was an inevitability. Initial Irish action on the Dunnes strike was very slow, with the majority of politicians here adopting something of a ‘wait and see’ approach. Given that international policy had been similarly slow to make a concrete movement against the South African regime despite the heightened racial violence there, that approach was perhaps understandable. Nevertheless, the strike was nearly a year old and a source of considerable embarrassment for the government before the Minister for Labour Ruairí Quinn took a hand. By that stage the strike had been causing all manner of trouble for the government in different ways. In this regard, the unions were to the fore. Dunnes, for its part, maintained that the issue was a political one and that there was nothing that it could do to halt the strike. 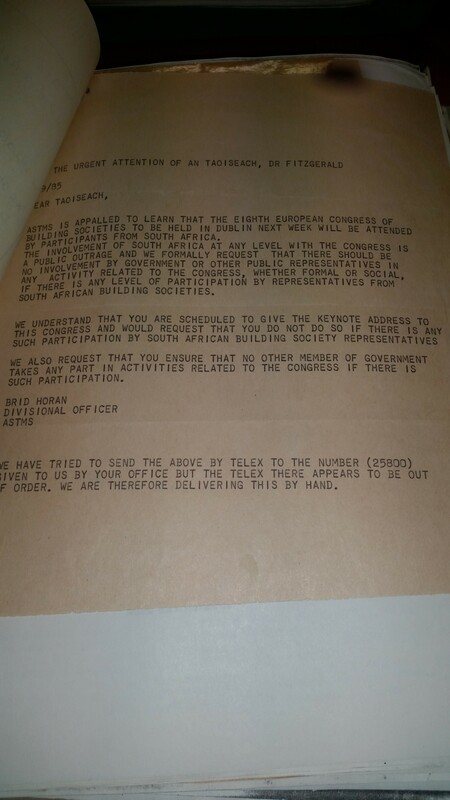 In September 1985, as the strike entered its 14th month, Taoiseach Garret FitzGerald was due to make a speech at an event for the European Congress of Building Societies, an event that was to be attended by several South African corporate representatives. The involvement of South Africa at any level with the congress is a public outrage and we formally request that there should be no involvement by government or other public representatives in any activity related to the congress. In the end FitzGerald made his speech on the basis that the South Africans present were there in a private capacity, as opposed to being official representatives of the NP government. 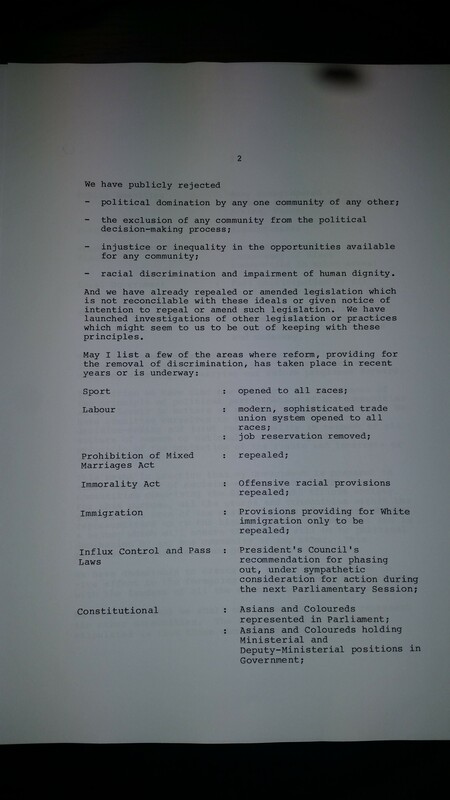 The Irish Anti-Apartheid Movement (IAAM) was another vocal player as the strike situation played itself out. 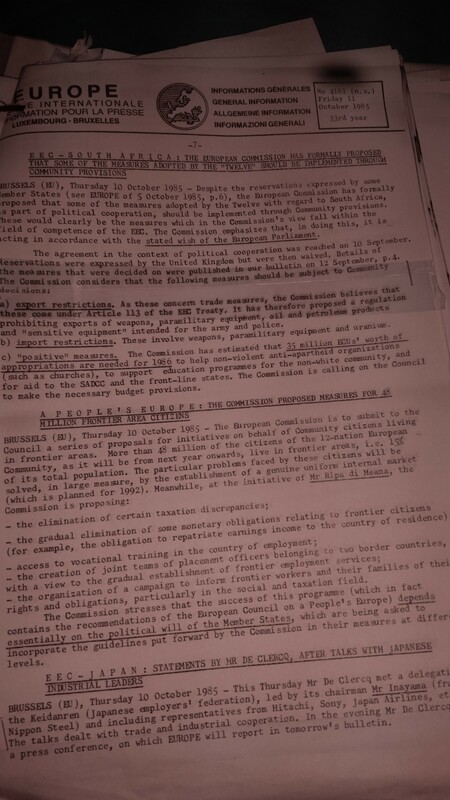 The movement repeatedly wrote letters to the Taoiseach asking that economic sanctions and a formal government policy be employed with regard to the South African situation. 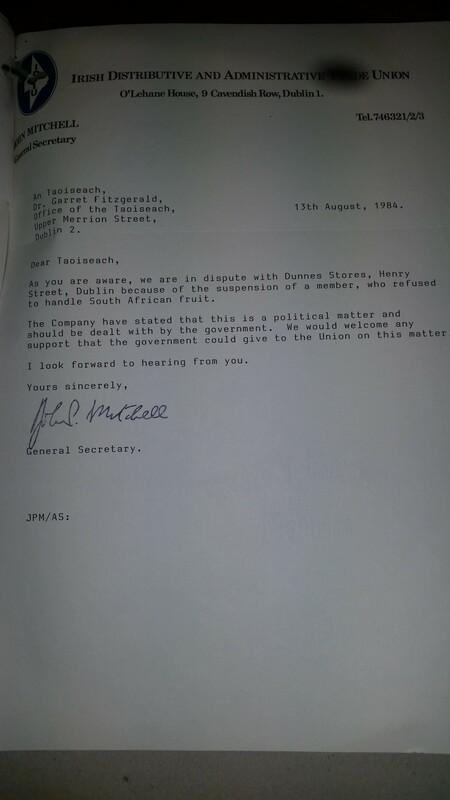 Dear Dr FitzGerald, we understand that the cabinet is meeting this afternoon to consider its reaction to the appalling South African treatment of the Dunnes strikers. As you know, my government decided last February that they would not meet deputations that include members of Sinn Féin… Nothing that has happened since… has caused us to alter that decision… I assume you will arrange for the deletion of my name from your notepaper as soon as possible. In effect, the strike came down to a matter of sanctions. 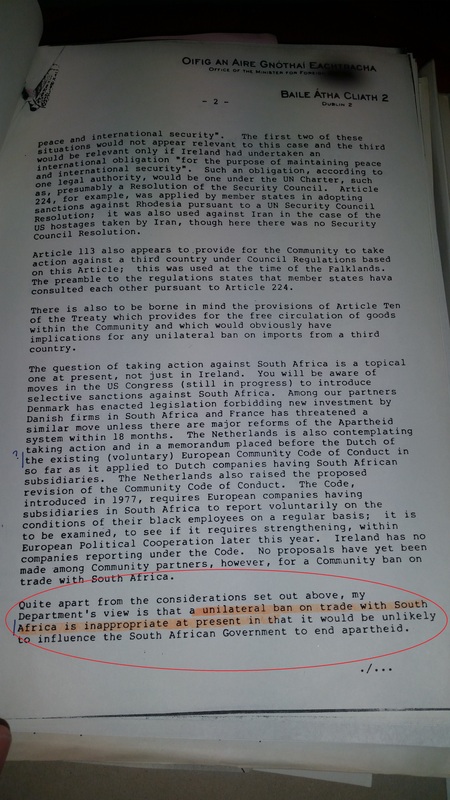 The government, as one of the then-10 members of the European Economic Community (EEC), was coming under increasing pressure to cease trade links with South Africa. One government minister who was wholly opposed to sanctions of any kind was then Fine Gael Minister for Industry (and future Taoiseach) John Bruton. A unilateral ban on trade with South Africa is inappropriate at present in that it would be unlikely to influence the South African government to end apartheid. One of the most important developments in the Dunnes saga in 1985 was the execution by the South African authorities of black poet Benjamin Moloise, who had been accused of the murder of a policeman in 1982. Execution by hanging in South Africa was commonplace at the time, nevertheless Moloise’s case captured international attention, not least because the militant (and banned) African National Congress (ANC, of which Nelson Mandela was the imprisoned figurehead) movement had claimed responsibility for the Johannesburg murder, and instisted that Moloise was in no way involved. Despite international appeals for clemency, Moloise was hung in Pretoria on 18 October, 1985. His death sparked furious protests and outbreaks of violence in South Africa itself and condemnation from the international community. It is to be hoped that the South African government, with the eyes of the the world focused on them as never before in recent months will at this later hour relent and commute the sentence on Mr Moloise. 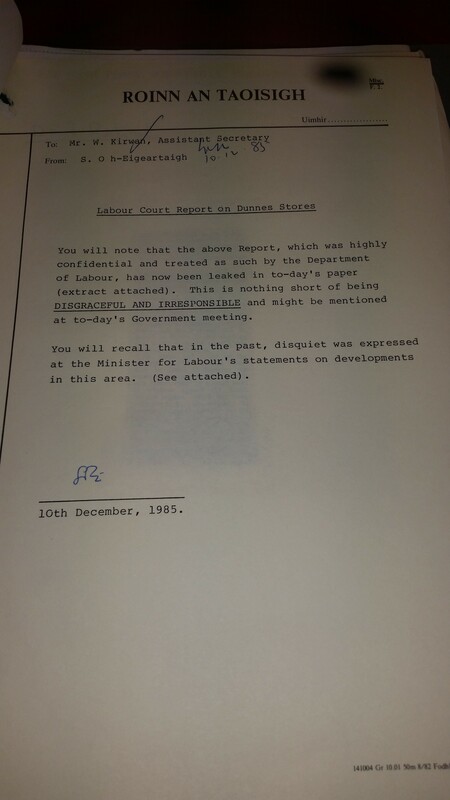 As pressure from the unions increased, with the Labour Party itself demanding action, and with no sign of an end to the impasse in sight, Minister for Labour Ruairí Quinn became embroiled in the situation in March 1985. 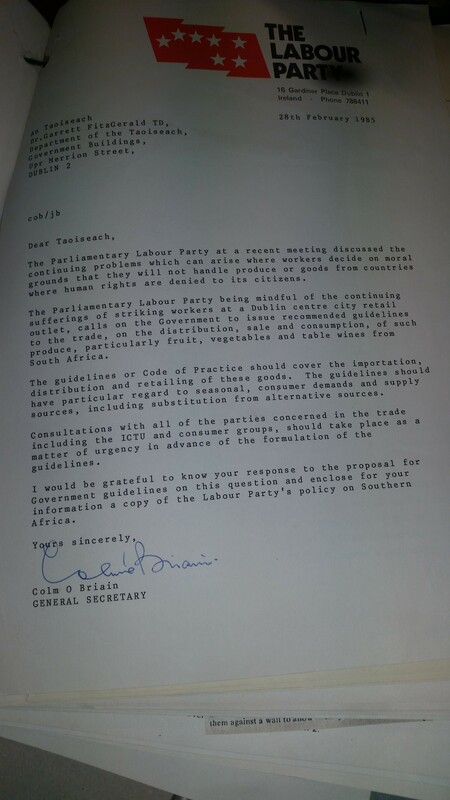 The Parliamentary Labour Party being mindful of the continuing sufferings of striking workers at a Dublin centre city retail outlet, calls on the government to issue recommended guidelines to the trade, on the distribution, sale and consumption, of such produce, particularly fruit, vegetables and table wines from South Africa. Quinn, who was firmly of the belief that he could have a positive effect on the strike negotiations, referred the case to the Labour Court in April with a view to bringing the industrial action to an end. Their initial recommendation was that the supermarkets should be asked to voluntarily impose a ban on the sale of South African produce. The minister approached the supermarkets with this proposal, but no positive resolution could be reached. Their response was that as non-political organisations it was not really part of their remit to form codes of practice vis a vis the ban of importation of South African produce. The matter was sent back to the Labour Court. This time the recommendation received was relatively simple – it suggested that normal industrial relations could not end the strike, and that a political move would be the only way to break the stalemate – specifically economic sanctions against South Africa. So secret were those recommendations, delivered in December, that the Taoiseach’s department, the Department of Labour and the Labour Court all gave heartfelt assurances that the findings of the court’s report would be kept under wraps. 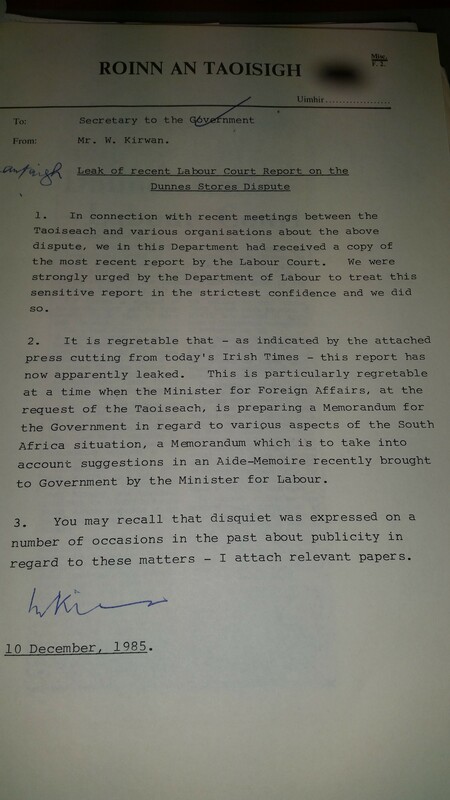 So naturally, in the grand tradition of Irish politics, the recommendations were leaked (this was considered particularly inopportune given foreign affairs minister Peter Barry was due to bring a memorandum to government regarding the imposition of economic sanctions on South Africa). 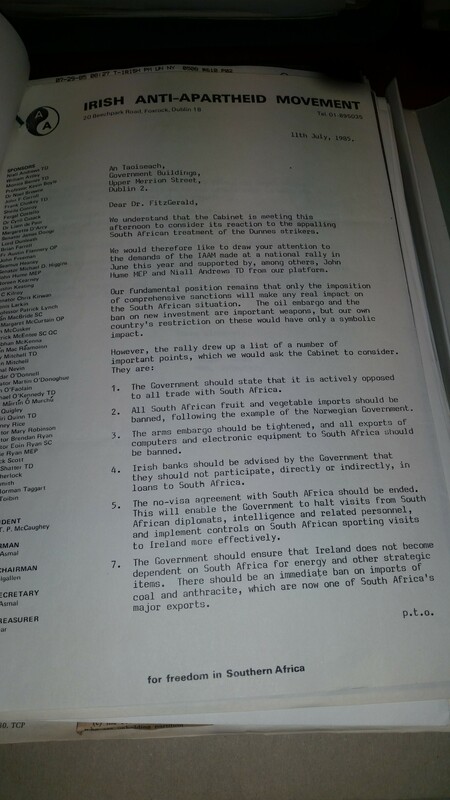 For all the endless discussion, Ireland did not set a specific example in cutting economic ties with South Africa but rather followed the recommendations of the EEC Ten of October 1985. These initially took the form of the cessation of investment in South Africa, the banning of loans to that country, and an end to all promotion of trade and military and nuclear collaboration. Most of these meant little from an Irish point of view. 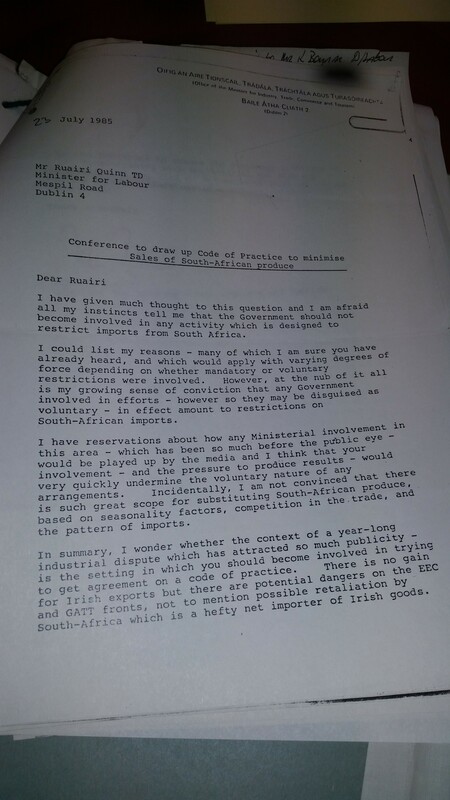 The wholesale ban of South African imports did not come about in Ireland until 1987. At the same time the Dunnes Stores strike itself finally came to an end. Three years later ANC president Nelson Mandela was freed. The journey of the strikers to South Africa in July 1985 did not go well. They were detained upon arrival, held under armed guard, and shipped out once more on the first return flight, an act which led TD Proinsias de Rossa to proclaim that “the South African government has taken political action against 15 Irish citizens” in the Dáil in July 1985. Most of the strikers (some by then lived abroad) met with Nelson Mandela when he visited Dublin following his release in 1990, and when he died in 2013 some of them made the journey to his homeland for his funeral. Various government memos from the time indicate that they think the strike could have been prevented if any degree of common-sense had been shown by the supervisors at the Henry Street branch of Dunnes. Instead, an international sensation spiralled from humble beginnings. 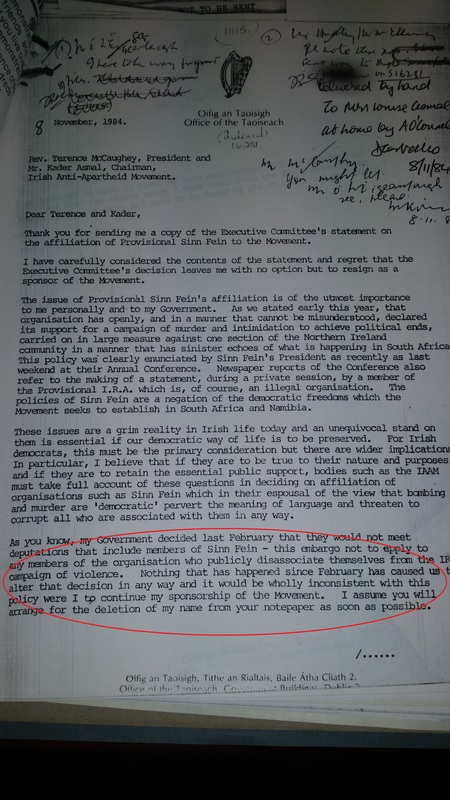 Perhaps the last word should be given to the Taoiseach, Garret FitzGerald, who was on the receiving end of a letter of rebuke regarding Ireland’s support of economic sanctions from South African leader PW Botha (essentially a ‘mind your own business’ sort of letter). 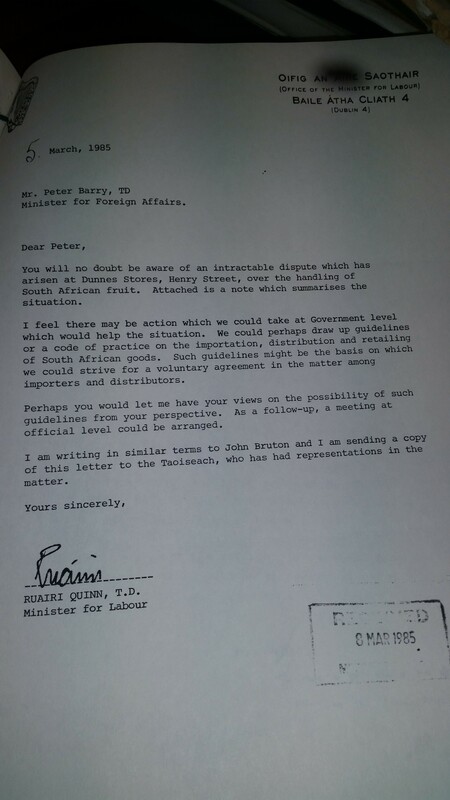 The letter arrived in Ireland in late November 1985 via quite convoluted channels (it was passed by the South African ambassador to England to the Irish ambassador in London) given Ireland had no South African embassy. 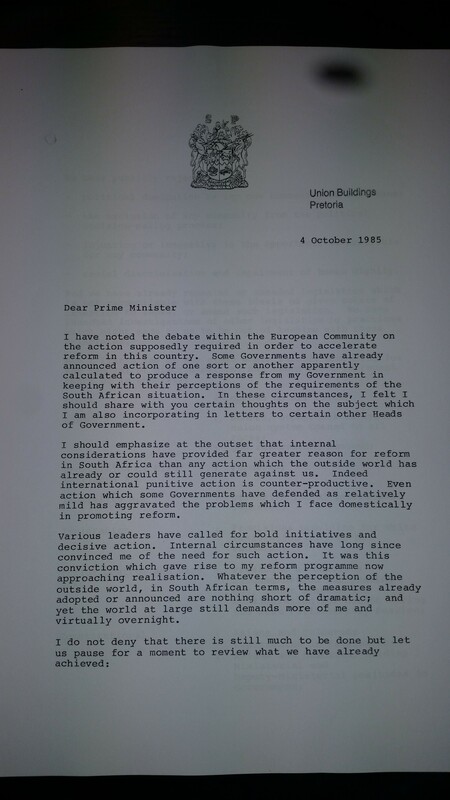 Botha essentially objected to international condemnation and ostracisation of his country, argued that reforms were being constantly introduced to South Africa, and that “international punitive action is counter-productive”. It is not the wish or the intention of the government of Ireland to prescribe the methods for reform in South Africa. That is a matter for the people of South Africa themselves. It is however the view of the government and people of Ireland… that it is the system of apartheid in South Africa which is the root cause of the violence and alienation which bedevil the country and the region and that until the structure of apartheid has been dismantled, violence and instability will continue. Email “30 years ago Dunnes Stores was involved in ANOTHER workers' dispute... one that shook the world”. Feedback on “30 years ago Dunnes Stores was involved in ANOTHER workers' dispute... one that shook the world”.